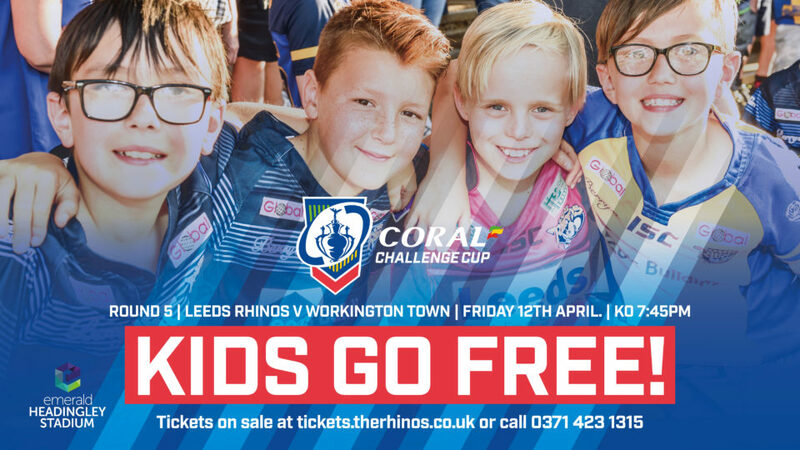 Leeds Rhinos host Workington Town in the fifth round of the Coral Challenge Cup at Emerald Headingley Stadium this Friday 12th April, kick off 7.45pm. Here’s all the information you need ahead of joining us on match day. We’re delighted to offer free tickets to all juniors aged 16 & under this Friday for both standing positions in the South Stand Terrace or Extentia Terrace and reserved seats in the South Stand or Extentia Stand. Juniors must claim a free ticket to gain access on match day, especially those who would like a seat. There will be a designated free junior turnstile on match day however this will only allow access to the standing terraces. Please note that Junior Season Members do not need to use their voucher from the Away Ticket Booklet in order to claim a free match ticket this week. 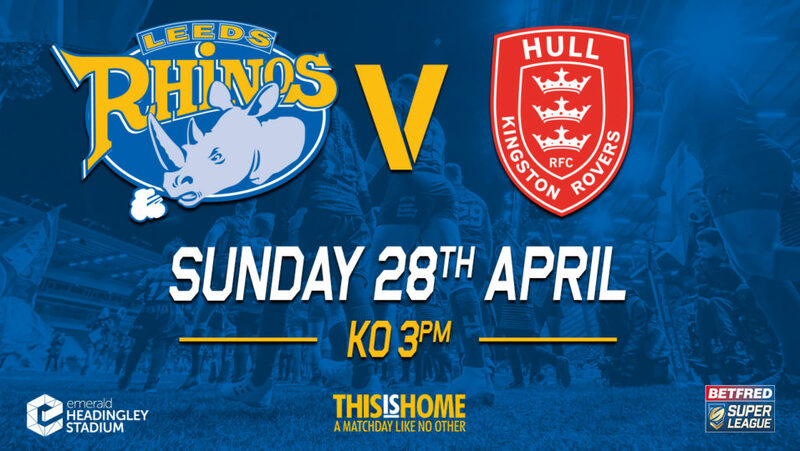 You can book your spot online at tickets.therhinos.co.uk and choose our print at home ticket option, meaning you avoid the £1.50 booking fee and save you having to collect your tickets on match day. 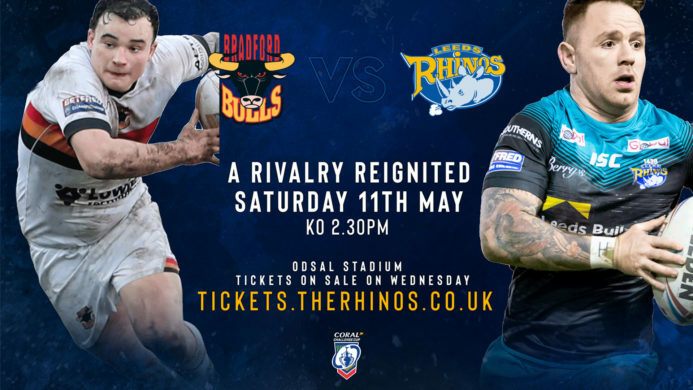 Alternatively book your tickets over the phone on 0371 423 1315 or buy in person from the Ticket Office at Emerald Headingley Stadium (open 9am-5pm Mon-Fri). Please note that prices do not increase on match day for this fixture. Please note this fixture is not included in 2019 Season Membership. If you’re a Season or Supporter Member and would like to upload the game onto your card you must input your valid customer number (as printed on your membership card) when buying online. If you opt for a different position to your Season Membership you’ll receive a match ticket instead. Turnstiles open at 5.45pm on Friday. If you need to collect your tickets on match night please head to the collections point in the Ticket Office on St Michael’s Lane. The St Michael’s Lane turnstiles will be available for all fans to enter the ground as well as those wanting to pay cash on the day. The South Stand turnstiles are for match ticket holders only. Remember there are no cash turnstiles at the South Stand. The Kirkstall Lane turnstiles and the West Terrace are closed for this match. Fans with a standing ticket can go between the Extentia Terrace and South Stand Terrace this Friday. Bag searches are in operation at all turnstiles & bags must not be larger than an A4 piece of paper in size. All cards and tickets will be checked upon entry into the stands and remember that if you have any issues with your match day experience please text our fans phone on 07500 312 832. With free entertainment around the ground from gates opening to right after the final whistle, come on down early and enjoy what’s on offer! Enjoy pre game analysis and player interviews on the South Stand podium from your match day hosts, Leeds Rhinos Women’s Danika Priim and Rugby League commentator Matt Horton. They will be joined by singer Scott Lloyd for live music in the South Stand concourse and there will also be music from busker Will Hancock outside the Club Shop on match night. Fans can enjoy free face painting and balloon modelling around the ground before kick off and look out for everyone’s favourite mascot, Ronnie the Rhino, who will be entertaining fans and up to his usual antics on match day. Please note there is no Kids Zone area available pre match for this fixture only. 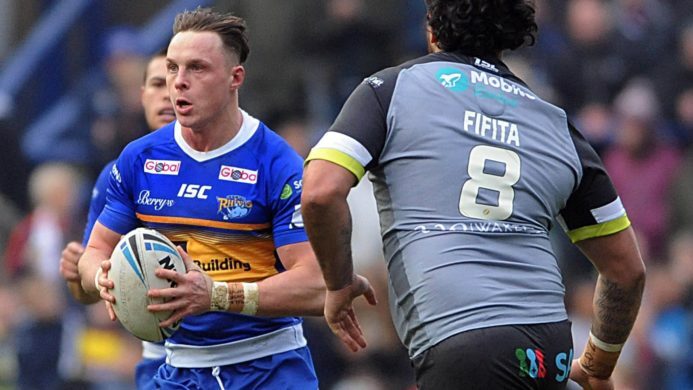 Leeds Rhinos Players will be coming into the South Stand Concourse after the match to meet fans, so stick around after the final whistle and enjoy more post match analysis and interviews in the South Stand concourse from Matt and Danika and you can also enjoy discounts up to £1 off all draught products in the South Stand concourse bars. Please note the Long Bar is not open this Friday. Come along on match day and pay cash on the St Michael’s Lane turnstiles (Gate B) for standing entry to the Extentia Terrace or South Stand Terrace. If you’d like to pay to upgrade to reserved seating in the South Stand or Extentia Stand seats please head to the transfer windows at the Ticket Office (next to the Club Shop) once you are inside the ground. Seat upgrades are subject to availability. Please note that there are no cash turnstiles at the South Stand. Ticket prices stay the same and do not increase on match day. Kids tickets are still free on Friday but juniors must enter via the designated turnstile on St Michael’s Lane for entry to the standing terraces. Enjoy a pint on match night with our new reusable cups. Available on all bars in the stadium (with the exception of the Long Bar), the cups are just £1 deposit and there are 3 heritage designs, featuring images of ex-players and club legends through the years, as well as classic Rhinos blue and amber designs. At the end of the night, keep your cup as a souvenir or return it to the bar to claim your deposit! Fans can also stick around after the match and enjoy discounts up to £1 off on all draught products in the South Stand concourse bars. All our bars accept cash, debit/credit card and contactless payments as well as apple and android pay.